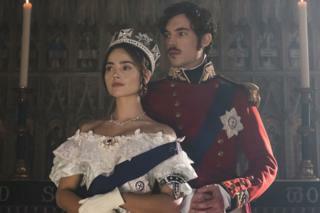 ITV’s royal drama Victoria is back, with Jenna Coleman as the queen, Tom Hughes as her husband Albert, and an unexpected dash of contemporary resonance. President Trump’s announcement that he is sending more US troops to Afghanistan marks the beginning of yet another chapter in America’s longest-running war. It also lends a curious topicality to the new series of ITV drama Victoria, which begins with news of a military setback to British forces stationed in that country. “Writing this show is extraordinary,” says Daisy Goodwin, the show’s creator and executive producer. “There are times it feels like you’re writing it in the present. Throw in a Conservative prime minister who tenders his resignation after a Parliamentary defeat and the parallels are indeed uncanny. Yet one thing has definitely changed for Victoria since the first series. As well as being a wife and monarch, she is now also a mother. The second series begins with her cradling one baby in her arms. By the time it ends, she will be onto baby number three – of nine. The queen, however, had no love of being pregnant and loathed being forced to spend the post-partum period in bed or a bath chair. “She has been in confinement since the birth of her child, so she is not in the best of tempers,” remarks lead actress Jenna Coleman. It doesn’t help that Albert has a stubbornly independent streak and is itching to be more than just a loyal and supportive consort. “Albert’s journey in the previous series was about him trying to find some freedom of expression and identity,” says actor Tom Hughes. As their impressive progeny shows, Victoria and Albert were very much in love. But that didn’t stop them occasionally being at loggerheads. “I think of them as being like Elizabeth Taylor and Richard Burton,” says Goodwin, referring to the legendary Hollywood power couple of yesteryear. Coleman has some advice for any budding actors keen to know how to orchestrate a convincing marital barney. Hughes, meanwhile, makes the point that on-screen chemistry is not something that can be planned or manufactured. With its opulent production values, period setting and upstairs-downstairs plotting, Victoria is shaping up to be a Downton Abbey-sized success for the commercial broadcaster. The connections continue with the casting of Dame Diana Rigg as the Duchess of Buccleuch, a disapproving matriarch highly reminiscent of the one Dame Maggie Smith played throughout Downton’s six series. The veteran actress, she continued, “brings a certain asperity to the screen and the set” and insisted on a bottle of Prosecco at the end of each day’s shooting. “She drinks one glass and shares the rest with the make-up ladies,” says Goodwin of an actress whose casting as Victoria’s Mistress of the Robes follows her role as Olenna Tyrell in HBO’s Game of Thrones. Victoria may lag behind that show in the blood and thunder stakes, but there’s no doubting audiences have taken it to their hearts. The first series drew an average audience of 7.7 million viewers and was sold to 350 territories worldwide, the United States included. Its subject is very much in the zeitgeist this autumn. Not only do we have Jenna Coleman as the young queen on television, but we also have Dame Judi Dench as the older version in Victoria and Abdul. Dame Judi previously played Victoria in 1997’s Mrs Brown, as did Emily Blunt in 2009’s The Young Victoria – another dramatisation of the sovereign’s early years. “It’s a great escapist treat but it’s also a mirror to our times,” says executive Damien Timmer when asked to account for the continued appeal of period dramas about the great, the good and the regal. The second series of Victoria begins on ITV on Sunday at 21:05 BST.